This is definitely an excellent idea. Twitter is an awesome communication medium to organically build an amorphous, geographically-spread, community of alumni from any institution. NITT was started in 1964. That means there must be at least 45 batches of Engineers (and slightly lesser numbers of MBAs, PhDs, post-graduate degree holders, ....) who have passed out from NITT ( & erstwhile RECT ). One the one end of this alumni spectrum are the 'kids' who have just passed out of NITT, and who are to the most part gung-ho about - and aware of - Twitter. On the the other end of the spectrum are people whose most important worries these days are about their grand-kids, and are not likely to bother too much about Twitter. I passed out from NITT in 1994, and thanks to two yahoo group mailing lists, am in communication with (a) most of the people from my batch, and (b) most of the NITT graduates who are settled in the US. Having another channel of communication and connection, which spreads across batches and locations is definitely a useful thing, in my view. There are some topics that is of interest to everyone in the alumni - irrespective of which batch they are from, and where they are located. Having such a channel would also foster communication among the alumni and strengthen the community. And yada yada yada :-) OK, in conclusion, I see immense benefits of a communication channel through twitter for NITT alumni. Such a channel could work only if it is very simple, and easy for most to adopt, and with the minimum of rules. Spread the word about this usage to others in the alumni - through mailing lists, at alumni meetups, etc. 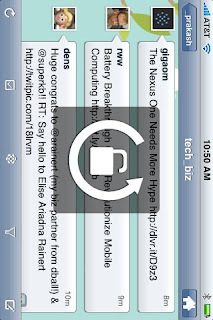 Use an additional hash-tag or a modified hash-tag for a specific event. Eg: If, say, alumni of NITT 2009 batch want to 'meetup' over twitter one weekend for a couple of hours, that event can have a slightly different hash-tag. eg: #nitt2009meetup. Or communication around the next TEDxTrichy event could have both #nittrichy and #TEDxTrichy hash-tags. Those are some of my initial thoughts about how this will work. What do you think? - Do you think there is benefit in having an alumni network for NITT through Twitter? 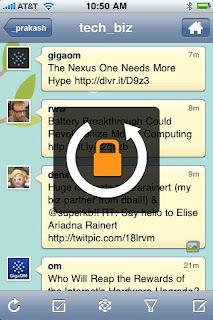 - What are your suggestions to make such a network become alive and thrive? - What do you expect to get from such an alumni channel? - Any other thoughts and suggestions? Just finished watching the second season of AMC's Breaking Bad and now am eagerly waiting for the release of third season on DVD; it won't be out before March 2011, going by the dates for release on DVD for the first two seasons. That's a long wait! The first two seasons have been phenomenal; very absorbing right through with no slacking of excitement in the slightest at any moment. It has been so captivating that I have frequently found it hard to resist temptation to continue and watch the next episode after finishing one. Each episode usually begins with a sense of fore-boding with a preview of whats to come later in the episode or season, and takes the viewers through a edge of the seat thrill-a-minute ride for 45 minutes or so, and leaves the viewers begging for more at the end. What surprises me most is that I am firmly rooting for the main characters Walter White (Bryan Cranston in a superb performance) & Jesse Pinkman (Aaron Paul) despite the heinous crimes they willingly or unwillingly commit. Given the story line (a chemistry teacher - and one of his pupils - turn into Meth producers & dealers, killing a few people directly along the way), it is very easy to not like the main characters. However, the story firmly focuses on their struggles, and their ingenuity - especially Walter's application of his immense practical knowledge of Chemistry - in coming out of every tough situation with flying colors, or at least with only minor setbacks. The show totally ignores or avoids showing any negative aspects of what the main characters do - with hardly any scenes of the sufferings and travails of their end users - the drug addicts. Even the seriousness of Jesse Pinkman's drug habit (which leads to his girl-friend's death) gets lost in the excitement of the other story lines. All said and done, this is a show worth watching - HIGHLY RECOMMENDED! Put it on your Netflix queue; or even better - buy the DVD. Met up with Marty Haught of Boulder Ruby fame yesterday at a Coffee shop in Longmont (the city in which both of us live); my objective for the meeting was to pick his brains on how to go from being a beginner and work towards becoming proficient in Ruby & Ruby on Rails. Got quite a bit of useful advice, and list of resources for self-learning from Marty in this regard. RailsGuides - with a very useful Getting Started with Rails guide. New Relic - For those interested in Performance management of Web applications. 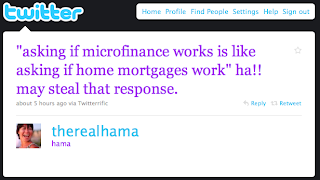 Powerful answer to "Does Microfinance work?" A few well-formed words can have an amazing impact! I saw the below tweet from a friend earlier today, and that set off a chain of thought, answering some unanswered questions from long ago, and resulted in a concrete action making a small impact for a few people. I am involved with micro-lending through Kiva for a couple of years now, and have been a believer in the concept of Micro-finance. Since starting to lend on Kiva, I have come across a few articles on the internet which question the benefits of Microfinance. While not going into the details of these articles, suffice it to say they did succeed in sowing a seed of doubt in my mind about the value of the loans I make. I have continued to revolve the initial money I put into Kiva within the same network by lending it to other entrepreneurs. A touch of skepticism - and even resignation - has accompanied these actions. I am fortunate on numerous counts in my life; I live a privileged life compared to the majority of the people in the world. Kiva - & Microfinance - is a way to provide an opportunity to a few people who wouldn't have got that opportunity otherwise. Following the above epiphany, as soon as I got some time to spare, I logged on to Kiva, and added a few more loans to my portfolio. 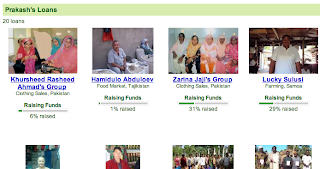 One 'short-coming' of Kiva is that it does not have Microfinance partner organizations in India; so all my loans on Kiva are to people in many countries across the world excluding India. 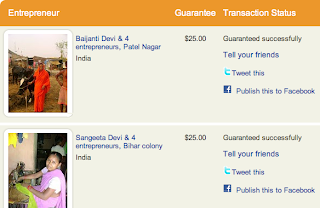 Recently got to know of a Kiva-clone - United Prosperity - that addresses this gap in Kiva's offering. I have lent to a couple of entrepreneurs on United Prosperity as well. I invite my friends to follow my example and make a difference for 'underprivileged micro-entrepreneurs' by lending on Kiva and/or United Prosperity. Thanks for reading this, and thanks for following up on my request! So I am finally well-settled in Longmont, CO - with Internet Connectivity the last piece to fall in place on Saturday - and am getting around to document the 2000 mile road trip adventure! 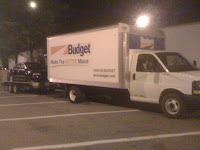 Vehicle : The Sturdy Road Warrior in the picture - 16 Foot Budget Truck, with a tow carrier for my Volkswagen Passat. At the end of the trip, it seemed like a piece of cake. However, it was a nerve-wracking experience right from the get-go, and I was afraid something could go wrong at any minute during the trip. The only jarring note came when I went to return the truck - one of the wheels on the trailer had fallen off! It must have occurred during the last segment of my journey - the 200 mile drive from Colorado Welcome Center in Burlington, CO to Longmont, CO; I am guessing this because I had stopped at the welcome center, and had not noticed anything unusual. In any case, I have been truly lucky in that there were no incidents along the way, and everything went smoothly. The best thing about the road-trip turned out to be the awesome home-made food my friends treated me to, and ensure that I didn't have to go looking for food along the way. Given that I was hauling a car with a truck, I was apprehensive about going off the highway, and try my luck at finding a good restaurant with adequate parking space for my truck. Thanks to my friends generosity which included packing food for me for the next segment of the drive, it so happened that I had to eat out at a restaurant only once during the three days trip! Found out that the Truckers stop at rest areas over night, and occupy all the spots in the Truck parking zone, and even use up the shoulder leading up to and out of the rest area. Thought I would get to park in one of these spots and sleep peacefully, but no chance of that. Finally, would up sleeping fitfully for an hour or so in the Car parking zone at one rest area. Tolls on the Highways turned out to be a annoyance during the trip. Had a shocker when I checked in at Delaware Water Gap Toll Booth when the toll inspector told me it would be $13 for my truck+tow, while the toll for cars there was $0.75; I am guessing, he considered my truck to be a commercial vehicle, and added the extra toll for the tow vehicle. Expressways around Chicago put up a different kind of challenge in that the entrances to the freeway were not manned, thereby allowing only vehicles with M-Pass (automated payment cards). I lost at least an hour on Wednesday morning trying to find one manned freeway entrance. Given the trouble with tollways, I looked up alternative routes where possible. The I-76 / I-71 / US Route 30 (Lincoln Highway) in Ohio & Indiana helped me bypass the Ohio Turnpike / I-80 all the way through to Chicago. These alternate routes turned out to be very comfortable drives with hardly any stops, and little traffic. And these routes were offered better scenery than the Interstate, what with little towns popping up every once in a while, and the road invariably becoming the main street in that town. There is a World's Largest Truck Stop in Iowa; was glad to see it as it had ample parking space for buses and trucks. There is a place called Lebanon in Kansas; this place is considered to be the geographical center of continental United States. The Wikipedia entry for this place has this gem : "In 1918, the Coast and Geodetic Survey found this "center" by balancing on a point a cardboard cutout shaped like the U.S" I started out with the intention to visit this place on the last day, but dropped the idea after I lost around half an hour trying to get to the nearest gas station before I run out of gas. Route 24 in Kansas was a wonderful local alternative to the monotonous I-70. 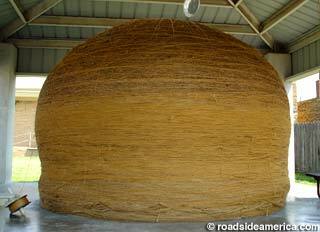 One of the highlights of the trip was Cawker City, KS which claimed (at the welcome sign outside town) that it was Home to the World's Largest Ball of Twine. Guess what? As I drove town, was pleasantly surprised to see they do have it displayed right next to the road! At the end of the journey, I am appreciative of how fortunate I am to have been on this road trip and come out of it without any problems, and thankful of all my friends who made sure everything went well with this trip! And I realize I enjoy these kinds of cross country road trips - the third such trip I have done in US in the past 10 years. I should plan next such road trip in an other country/continent. One of the companies that made a presentation - and stood apart from others - at yesterday's Boulder New Tech Meetup was DuckDuckDeal. It is a company which provides consumers with the ability - through a smartphone (currently only on iPhone) app or the DuckDuckDeal web page - to receive exclusive offers from local merchants instantly. Unlike the various coupon/deal sites already available, the key distinguishing feature here is that the merchants have the ability to post an ad-hoc offer with a limited time. This feature allows business establishments to figure out by trial and error which offers elicit best response, and thereby alter their offerings. DuckDuckDeal has a huge potential for growth as it provides a simple mechanism for businesses of all sizes - especially in the service and food & beverage industry - to fine-tune their businesses with minimal expense. The company is currently operational only in Boulder, and are perfecting the business model before they expand to other areas. I think DuckDuckDeal has the potential to be the next big thing. Google created an enormous money making machine with the search ads business; DuckDuckDeal could do a similar thing with focused promotions! The movie Avatar has been the number 1 movie in US for the past six weeks, and is expected to be at the top for a couple of weeks more at least. Rather surprisingly, it is no where near the top of the list of movies that has been number 1 for most weeks. In fact, if it holds out for two more weeks, it will only tie for the 10th place. The list of top ten movies that held the number one ranking for the most weeks has some very surprising entries. There is no surprise about the first two though - with E.T. The Extra Terrestrial being the number one on the list with 16 weeks, and Titanic being the second one with 15 weeks. In addition to the movie's might, the timing of the other releases is key as well for a movie's length of run at the top. It would be very difficult for any movie to beat E.T. The Extra Terrestrial's record. doesn't get why 'pushing the envelope' means risk-taking. Envelopes are, like, really easy to push. That was a very interesting observation! I had no idea what the answer was, and more importantly had never so far bothered to check. A quick google-search provided the answer: The phrase has mathematical roots, and the envelope here is the mathematical envelope. Wonder how many more phrases and idioms I use regularly, and haven't thought about the origins. LucidNYC January event - As interesting and entertaining as I expected it to be! 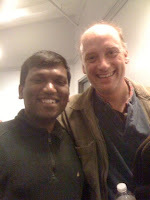 Last January, on Gaurav Mishra's invitation, I attended the Lucid NYC January 2009 event. It was an informal presentation set-up, with four people from different fields presenting about their work to predominantly young crowd. The event was in a loft-like empty space in mid-town Manhattan; The entry fees of $10 (I think) was collected at the door, and there were snacks and drinks, and a tips jar to go with it. The presentations were very interesting - the one talk that still stands out for me was from a last minute presenter talking about the curiosities of Video game pricing. In addition to learning new stuff, the event also allowed for meeting some great people. At that time, the impression I got was "This is a great event organization; and New Yorkers should benefit from it before Lucid grows too big and too impersonal". For many reasons, I haven't been able to go to any event since then. Yesterday, I was at the Lucid NYC Jan 2010 event, and it lived up to my expectations! Leo Bonnani of Sourcemap.org talked about mapping and displaying in a visual manner the sources for various components of various items- example a Laptop, or restaurant menu item, etc. We could be seeing more of this everywhere soon. Ji Lee of Google talked about 'high-jacking' of concepts - with examples from his work including The Bubble Project. I particularly liked the New Museum ad campaign example and its ads in Subway stations. Andy Bichlbaum of The Yes Men gave an introduction to the work they have done so far, and some ideas about what they want to be doing next. I should watch the movie The Yes Men Fix the World soon. By the way, The Yes Men are looking for investments to expand their operations; if you are interested in making a contribution, write to them on their web-site. All together, I spent a little over two hours on a weekday evening for this event; it is a great way to learn new things and meet new people! 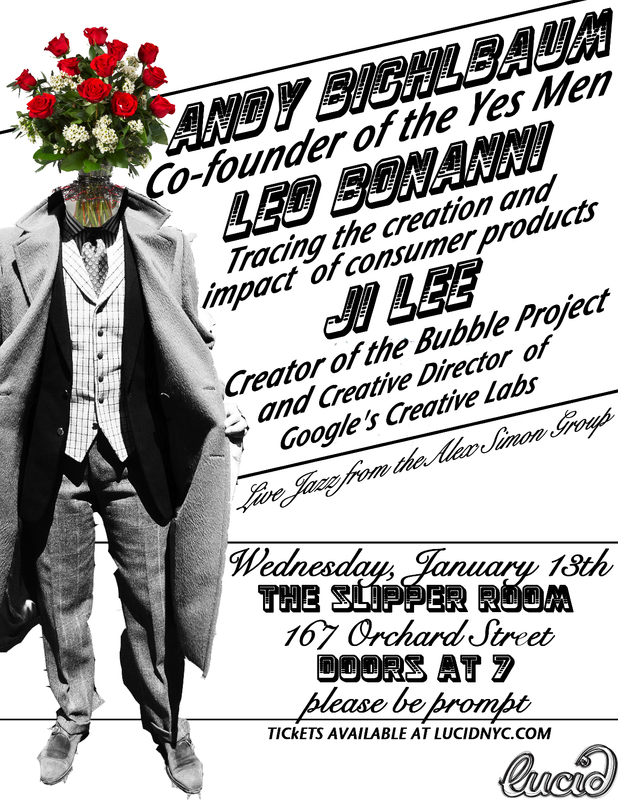 So the next time I attend a Lucid NYC event will not be in 2011 - as my past history would predict. And I reiterate with emphasis "New Yorkers should participate and benefit from it before Lucid grows too big and too impersonal"
One thing that had me hooked for the past four days was the amazing Test Match played out in Sydney by Australia and Pakistan - after dominating the game for the best part of the match, Pakistan ended up losing it on the fourth day. The character of the Cricket game and my tastes (more or less reflecting the general public's tastes) have changed significantly over the last few decades. I have been a Cricket fan for the past 25 years - starting to follow the game a couple of years after Cricket captured the nation's imagination after India's World Cup Triumph in 1983. The initial fascination was all about One Day Internationals. At that time Test Cricket was the boring cousin of the dazzling and exciting One Day Internationals. [For total newbies to Cricket - viz Americanos! - check out the wikipedia articles for the three main forms of International Cricket - Twenty20, One Day International and Test Cricket]. One Day Internationals were thrill-a-minute, ended in one day, and when played to completion (without interruption by the weather) had a result. Test Cricket was a drab affair drawn out over five days and most of the matches in the 80s and early 90s ended up as stalemates. South Africa choking at the finish line in arguably the best one-dayer of all time in the 1999 World Cup Semi-finals. Brushing my memory for any such fond memories of One Day Cricket from the 2000s, I am drawing a blank. Same goes for the latest favorite boy - Twenty20 Cricket - as well. The first and most important one of course being the great escape architected by VVS (Very Very Special!) Laxman and Rahul Dravid against the rampaging Australians at Kolkota 2001. I fell in love with Test Cricket after this match! Many of the India - Australia test matches played in Australia this decade which were either closely fought or won by Indians. Pakistan's recent test series against New Zealand and Australia. Test Cricket changed itself from being boring and stalemate-oriented to being exciting and result-oriented over the last decade and a half. And large part of the thanks for this development has to go to the Australian Cricket team who played Test Cricket at a whole new level and forced every other country to improve as well. Test Cricket, with its five day long canvas, allows for the contest to ebb and flow, and move in different directions - much more than the shorter format games. The long game also is an ultimate test of skills and gumption for the players. When this is capped by an urge to win and produce results - like Australia did in late 1990s and 2000s under the Captaincy of Mark Taylor, Steve Waugh and Ricky Ponting, and which has been followed by other countries with differing level of success - the Test Cricket only got better and better. It is a paradoxical thing that 5-day long Test Cricket is becoming more popular among the aficionados, while the length would make any newbie shun the game without much thought. The shorter version of the games - while being suitable for packaging to an audience conditioned by the limited time-bound nature of NFL/MLB games - doesn't really embody the nature and passion of the game that a Test match inspires among its devotees. Nevertheless, I am glad that more and more test matches are standing up and screaming to be put in the special archives these days. Long live Cricket! Long live Test Cricket!